Some of us may be sharing a little too much with our pets. The American Society for Microbiology study on prescribed antibiotics found that 25-percent of respondents reported using someone else’s antibiotics. What surprised researchers, but not to some veterinarians, was that 4-percent of respondents reported (actual written responses) that those drugs were pet prescriptions. Many respondents stating it was one way to get off-prescription antibiotics. The study ran in the recent edition of Antimicrobial Agents and Chemotherapy, according to a CNN article. Of the 400 demographically diverse adults surveyed, far too many people shared that they used antibiotics without a doctor's supervision, according to the co-authors, who are doctors in the Department of Family and Community Medicine at the Baylor College of Medicine. While the active ingredient(s) may be the same in human and animal formulations that doesn't mean the pills are identical—there's often a difference in dosage, and the inactive ingredients may differ (in kind and amount). According to verywell.com, many drugs sold or dispensed by veterinarians for the treatment of illness in small domestic animals are generic equivalents of human drugs, and medications produced for livestock and intended to be mixed with feed may not undergo the same level of manufacturing scrutiny by the U.S. Food and Drug Administration (FDA) as human drugs do. Either way it is illegal for veterinarians (or anyone else) to sell or dispense any medications that are intended for animals for human consumption like antibiotics. Packages prepared by the drug manufacturer have clearly marked "not for human consumption" or some similar phrase. For some it’s a matter of saving money. Others are abusing drugs prescribed to pets, or worse, they are intentionally injuring animals to obtain drugs. In some cases, family members are stealing the medication for use or trying to sell it. Unfortunately, most veterinarians do not have access to state-wide RX reporting systems, which physicians use to track prescriptions. 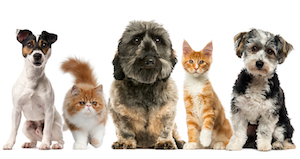 Some states like Ohio are working on new legislation and are working with the Ohio Veterinary Medical Association and state licensing boards to educate veterinarians about possible abuse by people who seek medications for dogs, cats and other pets. The American Veterinary Medical Association (AVMA) suggests that vets avoid giving unlimited refills of prescriptions or any other activity that might result in misuse of drugs. If your pet requires medication, it is always best to have the appropriate drug and dosage prescribed by a veterinarian. Be cautious of online pet pharmacies. “Discount pet drugs—no prescription required" may appeal to pet owners surfing the Web, but Food & Drug Administration (FDA) experts say it can be risky to buy drugs online from sites that tout this message and others like it. Click here to learn what the AVMA recommends for getting and filling pet prescription medications. Humans should always see their doctor to get the correct diagnosis and the appropriate treatment for any ailment. The world is already facing the potential loss of effective antibiotics and the overuse of antibiotics, including pet medication, is known to create antibiotic resistance which can impact everyone – human and pet. Do not self-diagnose and do not put your life or health at risk by consuming pet medication or un-prescribed medication. You can always ask your doctor or pharmacist to recommend a generic version of prescribed medication to help defray costs.